I am in love. I may or may not have said this about a few other bras that I have. Who am I kidding? If I have written about it, chances are, I am in love. 😉 But this one. Ahhh. This one is stunning. The Rose Long Line by Comexim. As usual, pictures do not do this bra justice. The black base, with the soft floral pattern are perfection. The fabric itself is very soft, and at first glance, is reminiscent of corduroy. Not the thickness, but the soft ridged texture. It is not textured enough to show under clothes, but adds enough to the fabric to really make it stand it out as not your “every day” bra. The roses are soft shades of a deep pink, mid tone and light pinks, with various shades of green leaves. There are also shades of yellow, gray, white and blue. The lines that come up through the fabric are a shimmery black and reflect the color that lies underneath. If the strip is over black, it reflects back. If it is over pink or green, it reflects those shades as well, further adding to the luxuriousness that is the Rose Long Line. There is a black bow accent at the gore, and lining the tops of the cups are two pieces of black elastic, with the sheerest black mesh like material connecting the two. 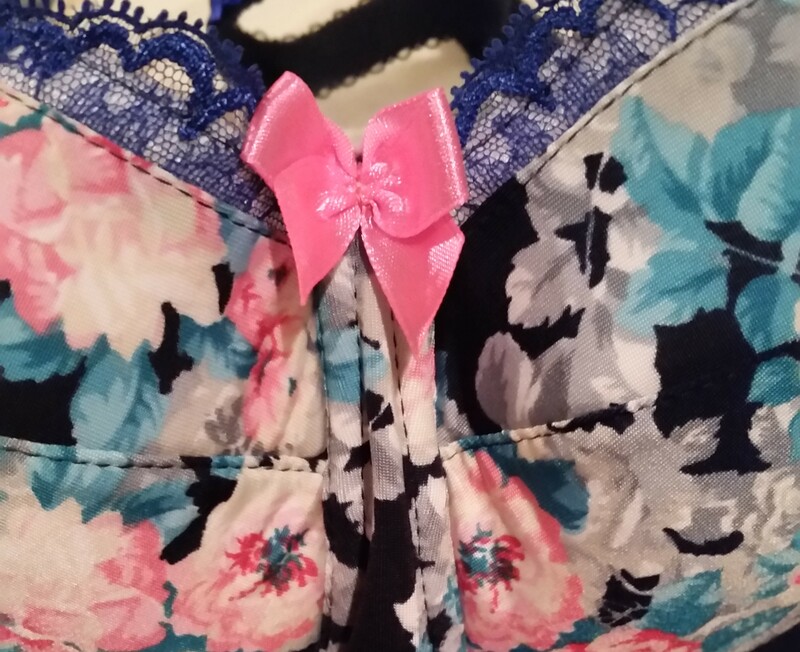 A panel of the floral print extends to the bottom of the band, down the center of the bra. 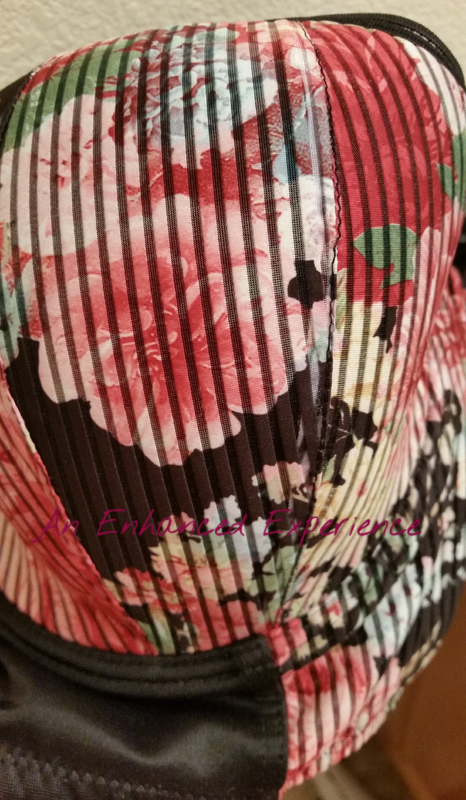 The back of the bra is solid black, as are the fully adjustable straps, that extends to meet the floral print in the front. There are three rows of 5 hook and eye closures. Mine is constructed of three-part half cups, allowing for the projection that I need. Rose is beyond comfortable, and extremely supportive, offering a delicate rounded lift. The inside of the bra is lined with black cotton. I think it goes without saying that when my fellow AEE bloggers and I were given the opportunity to receive Ewa Michalak’s latest collection early, we were beyond ecstatic and grateful. I chose 4 of their new styles: Letnia Noc, Colette, Pantera (all S styles), and Klaudyna (CHP). I am in love with all of them, and am reviewing Letnia Noc first. As usual, this bra is so much prettier in person. The floral print is a nice contrast of bright and deep, with pinks, whites, greys and greens on a navy base. The lace trim along the tops of the cups is a bright royal blue, and the straps have brillant blue ribbon stitched onto the navy base. There are pink bows at the straps and on the gore. It is a 3 hook and eye closure, and the cups are nice and smooth. The floral print extends around to the bands. The inside of the cups are white cotton with inserts for removable pads. I love that Ewa Michalak offers this option. Some days, you may want that extra bit of oomph, and others, you may want to play it down a bit. The removable pads also help with minor asymmetry that you may have, or during hormonal fluctuations. The band is true to size for me: not too stretchy, and not too firm. In other words, it is perfection. The band curves upwards a bit at the gore allowing for extra comfort. The wires are comfortable, and do not dig in under the armpits, on my ribs, or at the top of the gore. Before being introduced to Polish brands, my bras consisted of solid colors. No prints, no patterns. No adorable, gorgeous, decadent decorations at the gore; no little ribbons, bows or other extra pretty things. Now, I couldn’t imagine not having those things. With every new Polish bra I receive, there is always something to discover that you cannot see in the stock photos. This is not a bash on the stock photos at all. They give you a great idea of what the bra looks like, obviously. However, once you actually have it in your hot little hands, there is always something there that you couldn’t see in the stock photos. The attention to detail is never forgotten here. The way that the royal blue ribbon is stitched onto the straps, in a rippled/wavy way, is a wonderful example of this. A couple of weeks ago, Yoomee posted this comparison shot, and it got quite a bit of attention. The reality sunk in for a lot of people. These bras were nothing alike. The only things they had in common: 1. Made by famous bra maker Ewa Michalak; 2. both S styles, and 3. Both had a floral pattern to them. Lets break this down further. One of my favorites. The colors are vibrant, the fabric is luxuriously soft, and the floral pattern is a solid material that covers the entire bra. The straps are made of the same turquoise seen in the BM Landrynek, reviewed here. Kwiaty is made up of various shades of pinks, blues, turquoise, yellows, oranges, bits of green, all ranging from light in tone to very vivid with darker pinks and darker blues, as well. The gore has a turquoise bow with a rhinestone accent. The top of the cups is adorned with hot pink lace. The hooks and eyes are set on a turquoise solid base. Kwiaty is bright and bold in every way. The inside of the cups is made of white cotton with pockets for removable pads for asymmetry. The next set of lovely photos are provided by fellow AEE blogger and Polish Bra Junkie, jelzzz. Another favorite. This one isn’t quite as bright at Kwiaty. The base is a blue/turquoise. The cups have a lace overlay consisting of a beautiful, delicate floral pattern. The base color of the lace is very close to the base color of the bra itself. The lace has pink flowers and green leaves on it, with portions of the lace being shiny, almost silvery in tone. The lace comes up almost to the tops of the cups, leaving approximately an inch of the blue/turquoise cup base exposed, gradually decreasing as it moves to connect to the point where the straps meet the cups. The lace is only on the cups. The gore is made of the same blue/turquoise base material, with a hot pink bow as the center gore adornment. 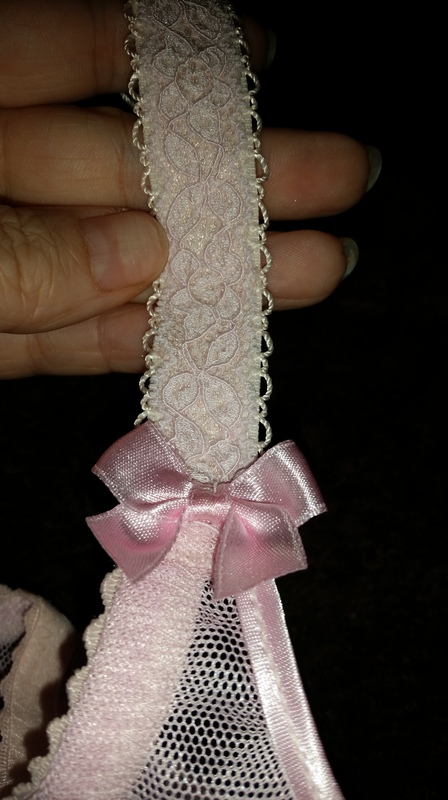 The same pink bows are placed where the straps meet the cup. Here is where we finally have something that is exactly the same as Kwiaty: the straps. They both have the same turquoise straps. They also both have the white cotton lining on the inside of the cups with pockets for removable pads for asymmetry. Now here is the question: which is your favorite? I cannot pick my favorite between the two. They offer so many differences that they each deserve a space in your lingerie wardrobe. I thought I might go a little more into my Polish Bra background for you. I am one of the newer converts of our group. I was so tired of being disappointed trying to shop for bras that fit properly in normal stores. Even if I found something that was close to my size, it was so unattractive, and did not appeal to me in the slightest. There were some that could have worked, and they were pretty, and lacy, and very expensive. I knew that there had to be better options out there somewhere for me! I had heard about a social group in a forum that I belonged to, of women that were buying the most gorgeous bras, that fit like a dream, and these beauties came from Poland. I immediately thought that there was no way I was going to order bras from a country where I did not speak the language, had no clue how to figure out my size, and what happens if it doesn’t fit? Then what? Ship it all the way back to Poland and wait for a proper sized bra? Nope. That was not for me. I am not a patient person. I like instant gratification. If I pay for something, I want it in my hands, right now. Please and thank you! I went back to the social group and started asking questions: how does this work? How do you determine your size? What do all of the different letters mean? What styles are for what purpose, breast shape, desired look? And finally, how do I order these beauties and from where? The ladies in the social group were beyond helpful, knowledgeable, and sweet. (They eventually became my fellow bloggers ;)) They helped to answer all of my questions, gave me some suggested sizes to try based on the measurements that I gave them, and that my friends, is when it was a wrap. I placed an order with Ewa Michalak for the SM Wróżka and S Szykuś, and an order with Comexim for the Snow and Ingrid Plunges, in two different sizes to narrow it down. Once the orders arrived, I could not believe how well made they were. The fabrics and laces were nothing short of luxurious. While none of them were a “perfect fit”, they gave me enough to know which direction to go with each brand. I don’t feel the same about ordering my bras and having to wait for them to arrive. I know that they are being made for me, and once they come home to me, will most likely be pure perfection 🙂 While I am waiting for them, I am plotting my next purchase. My fellow bloggers and I look forward to “Bra Day”. At least one of us is getting a package that day, and we love it. I am a Polish Bra Junkie, and I am proud of it. I cannot imagine my life without them. I am pushing my addiction… I mean help, enthusiasm and advice on my friends, family, pretty much anyone who will listen to me talk about them. Comexim. Comexim and Tropical Garden. What a perfect combination! I love Comexim for several reasons, and one of them is their willingness to alter your bra so that you have the perfect fit. The owner, Anna is a joy to work with, and she will customize a bra to fit you perfectly. Tropical Garden came in my second order with the following alterations: reduced cups, and a fix for some gaping material at both sides of the gore. This gaping was not noticeable under clothes but I knew it was there, and I didn’t like it. In order to explain what I was talking about, I sent some pictures to Anna, and she knew right away how to fix it. I have no idea what she did, so I call it the “Magic Trick”. 🙂 I ordered this bunch (5 bras in this order, and yes, they are all lovely) in an 80K, after my first order of an 80K and an 80L, both in standard cuts, to determine size. This bra runs very firm in the band. I have noticed this with my Geisha as well. I think it has to do with the black material used for the band. I have read several blogs and comments under reviews that reflect the same thinking. I did have to wear an extender the first couple of times I wore this one, but it has stretched to fit firmly, yet comfortably on the loosest set of hooks. I have several (ok, 26) Polish bras in my rotation currently, so this band will stay firm for awhile. The band currently measures 35 in. stretched, and 24.5 in. un-stretched. The floral pattern is a wonderful, bright contrast to the black base of the cups. This is a plunge style, and gives a nice, rounded shape. These are considered to be “padded”, however, I think of them more as lined than padded. The top of the cup is made of a black satin, which accentuates the black material and colorful floral print. I love bras that have more than one texture to them. I love bras that have all of the same fabric throughout. I love bras, who am I kidding? 😉 The inside of the cups is made of a black cotton lining. Tropical Garden is currently listed at 120,00 PLN on Comexim, which roughly converts to $31.84 USD, depending on the exchange range, and not including the PayPal increase for the currency exchange.